You are invited! | Save Palo Alto's Groundwater! ← Palo Alto’s 2018 Construction Dewatering Regulations Are Here! Save Palo Alto’s Groundwater and the City of Palo Alto are pleased to announce that Prof. Kristina Hill, U. C. Berkeley, an expert on urban planning and mitigation for climate change, has agreed to share her knowledge and experience with us on April 24th from 7 to 8:30 pm at the Mitchell Park Community Center El Palo Alto Room. Please join us for her presentation on Planning for Rising Waters: Sea Level, Groundwater and Bay Edge. This event is free, but please register. For years most coastal and Bay communities have focused their efforts on responding to sea level rise by planning and building sea walls, berms and other protective barriers against the water that will come ashore and threaten properties, shore ecosystems and infrastructure. However, until recently, many communities have missed an important consequence of sea level rise – the concurrent rise of groundwater. But, how important is groundwater rise? 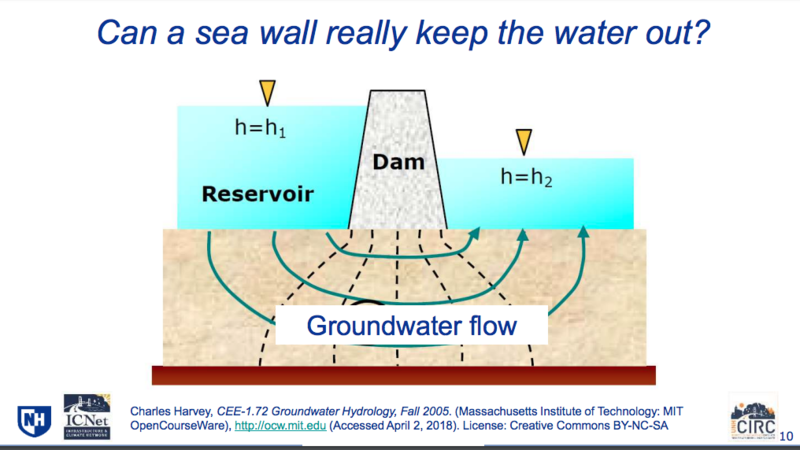 Modeling studies done for Hawaii and the state of New Hampshire indicate that groundwater rise can double the amount of area that would flood with only sea level rise. Additionally, this flooding could impact areas as far as 2.5 to 3 miles inland. This rise of groundwater can lead to increased risks of foundation instability, pipe infiltration and inflow, salinization of wells, premature road failure, remobilization of soil contaminants, flooding of basements and underground garages and liquefaction. Levees and sea walls don’t address the problems cause by groundwater rise. Our speaker, Dr. Hill, has intriguing ideas as to how cities can adapt to sea level and groundwater level rise in a seismic zone. Her lecture should be of interest to city planners, environmentalists, developers, policy makers, property owners, residents and everyone who wonders what we can do to mitigate and adapt to the rising waters now starting to be seen in the Bay Area. What we build today will likely last 30+ years. We invite everyone to join the conversation and start thinking about how we can address the future now. 2 Responses to You are invited! Your announcement has the confusing notation in the Crescent Park email that the meeting runs from 630AM to 830 AM. Really? The correct time is 6:30 – 8:30 PM (evening). We are sorry for the error and trying to get it corrected.